Tsada, Paphos – This luxury villa in Tsada is located in the Klimaka area of Tsada near the Minthis Hills Golf course. 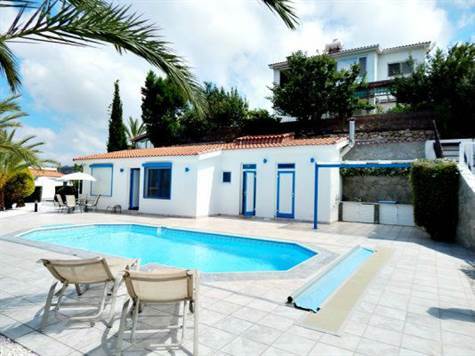 The property has 3 bedrooms double bedrooms with fitted wardrobes, a separate guest house and amazing panoramic sea views overlooking Paphos. This home has undergone extensive renovations and comprises 2 receptions areas with open plan dining – kitchen. A family bathroom with shower, the master bedroom is ensuite with corner bath. Window extensions were imported from Germany and added to the front of the property, with inside stairs that lead to further window extensions at the side of the house. The guest house has also been renovated and comprises of an open plan lounge- dining area- kitchenette, twin bedroom and a bathroom with shower. The villa and guest house have central heating and underfloor heating in the window extension areas. The interior of the home has unique grey tile work that continues out to the two outside patios. There is a heated pool with electric safety cover. There is a spacious poolside terrace and BBQ area, us poolside WC and patios, winter garden with cooking facilities and storage. There is a garage with electric shutters. The property comes fully furnished and is excellent as a second home or permanent residence. This property is in excellent condition throughout and has to be viewed to be appreciated, with freehold title deeds. Designed by Architect Jurgen Vohringer. ← Previous Previous post: Brexit & Cyprus – What Next?